Samwel Muchai won two gold medals for Kenya in Rio. Kenya ended its Paralympics campaign on a high on Sunday as Nancy Koech added a silver as the nine athletes managed a six medal haul, a great improvement from the London games. Kenya's campaign was almost dampened by an anti doping violation of powerlifter Gabriel Wanjiku after he returned a positive test for an out of competition test conducted on July 29, 2016. Wanjiku who finished at the bottom of the 59kg class after three failed attempts was not sanctioned as the International Paralympic test noted he innocetly took a cough medicine which contained a banned substance. Kenya finished at position 35 with three gold medals, a silver medal and two bronze medals and ranked seventh in Africa behind Nigeria, the highest placed nation in the continent with eight gold and two silver and two bronze medals for 17th overall. In London four years ago, Kenya won two gold medals, two silver and two bronze medals. Koech who had also competed in the 200m events won the silver behind China’s Jin Zheng clocked a new world record as she took won the women’s 1,500m T11. The 25-year-old reigning world champion took to the front after the first lap and maintained her form well as she crossed the line in 4:38.92, knocking over five seconds off her previous world best. Koech clocked 4:42.12 ahead of Colombia’s Maritza Arango Buitrago (4:45.33) the bronze winner. 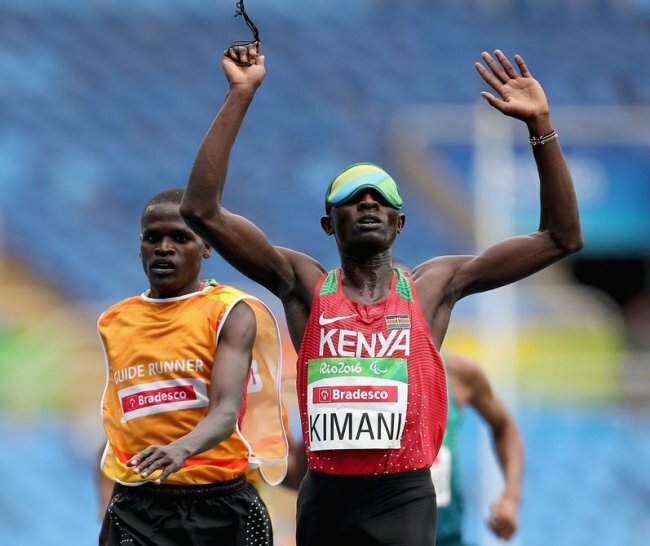 The star of the Kenyan team was Samwel Muchai who won two gold medal defending his 1500 crown adding the 5000 T11 while Henry Kirwa won the 5000m T13 gold after bronze in the 1500m. Wilson Bii had won bronze in the 5000m behind Muchai. Kenya was also represented by a rower Itaken Kipelian and Paralifter Gabriel Wanjiku. Sprinter Henry Nzungi and Nelly Nasimiyu. The runners who failed to progress to the finals of the event were disqualified on technicality as they failed to observe the racing rules.